Chinese culture is immensely profound and unique. Chinese characters are rich and full of meaning. For these reasons, students from other countries are attracted to learn about the Chinese culture. To assist foreign students in learning the Chinese language, a Chinese as a Foreign Language (CFL) Department was established at our school in July 2002. It has been fully approved and supported by the Zhejiang Provincial Education Department and the Ningbo municipal Education Department. The Chinese as a Foreign Language course covers the following key areas: Chinese listening skills (aural abilities)、Reading and Writing skill (literacy skills)、Oral Chinese (the spoken language)、About China, HSK learning, English (taught by Chinese teacher)、English (taught by Foreign teacher)、Mathematics, Information Technology, Music, Art, and Physical Education. A wide array of learning resources are available for students and include Chinese Textbooks、 published by Beijing Language University Press. As Korean students attain a certain Chinese level, they can be immersed into mainstream Chinese classes to further enhance their understanding of Chinese culture. We have some richly experienced teachers in teaching Chinese as an additional language and also some excellent young teachers who are both creative and innovative in their teaching methodologies. With over ten years of experience, our teachers have refined their effective teaching methods to help students achieve successful outcomes in the Hanyu Shuiping Kaoshi (HSK) test; a Chinese proficiency examination used for entrance into Chinese universities by foreigners. To create a balanced program, English as an Additional Language (EAL) classes are also provided. We have found that a mixture of Chinese and foreign staff is the ideal model for developing English literacy. The English program is taught by staff from China, America, Britain, and Australia. In providing a balanced curriculum the program provides a foundation for foreign students to be equipped with the skills to engage with the world as global citizens. To maximize student learning outcomes we endeavor to keep classes as small as possible with the maximum number for each class being set at 20 students. The smaller class sizes enable teachers to provide greater attention to the individual development of our students with their unique talents and interests. The school is also able to provide external lessons and aural Chinese, activities that takes learning Chinese from a theoretical mode of study to one where students are able to learn practical life lessons through everyday activities. By providing in context learning we have found that this enhances students’ interest in learning the language. When students attain certain level of proficiency in the Chinese language, foreign students can be emerged into a Chinese classes and learn together with Chinese students. It can be difficult for foreigners to learn Chinese because the Chinese characters are seen to be complicated. There are also a lot of Chinese idioms and Chinese proverbs which are used in everyday conversations. The grammatical construction of Chinese sentences can be the opposite that of other languages. By comparing language constructs in English, and Chinese, students are encouraged to explore the cultural and intellectual diversities that exist in language learning. When our school first establishmed the CSL Department, the school employed experienced university professors, who specialized in teaching Chinese as Foreign Language, to partner with our teachers in designing the curriculum. With their support and guidance, the curriculum and teaching methodologies were determined very quickly. During a short period of time a unique education model for teaching foreign students was established. Having accumulated 12 years of teaching experience, we are now equipped with a team of highly experienced teachers. Our success can be partly measured by the consistently high grades and rapid improvement shown by our students in HSK tests. We are confident that we the necessary foundation to assist a greater number of foreign students. 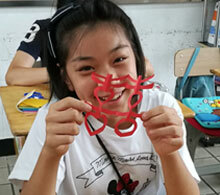 In the CFL Department, we provide extensive enrichment activities to students throughout the year so that they can explore and extend their areas of interest, such as a Mandarin Speaking Contest, Chinese Calligraphy, English Word game, student newspaper, International Food Festival and much more. Korean students are encouraged to take advantage of the many opportunities available to them. We also encourage student to take appropriate risks in their learning, to be courageous and to build their resilience through a experience a variety of activities and challenges. The school is proud of its sporting achievements, arts festivals and special events, which help to make NBHIS such a stimulating and vibrant environment. 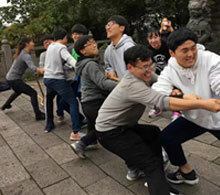 Students are provided the opportunities to attend inter-school sports, weekend homestays with local families and entertainment activities which foster friendships with Chinese students. Each year students can also be invited to give a performance held and broadcasted by Ningbo Television Station. At the end of each semester, assemblies are held to award top students that have shown their language development through their involvement school events. International students are provided specialized dormitories that have been created to meet international standards, whilst providing accommodation at the lowest possible cost to parents.For those students from Korea, a Korean Cafeteria is provided to specialized in Korean cuisines. Chefs from both Korea and China are employed to make authentic Chinese and International cuisines. Over the past 12 years, over 60 Korean students has been in universities in China or Korea and successfully achieves their goals and aspirations. Over forty of these have attended top universities, such as Peking University, Tsinghua University, Fudan University, Renming University of China, Beihang University, Shanghai Jiao Tong University, and Zhejiang University. We now hope to open the doors to a greater number of nationalities that might want to study Chinese. We encourage you make contact with our dedicated Admissions team that will assist you in exploring potential educational pathways available at Hua Mao. At this stage, there are more than 100 foreign students study and live happily in our campus. Welcome to Ningbo! Welcome to a world of opportunities.